With the number of Grand Prix in a season it is not at all surprising that more often than not we are busy working at Formula Renault events on GP weekends, and such was the case last weekend when we were at Silverstone for the Formula Renault Eurocup round and unable to be at Monza for the Italian Grand Prix. Monza is an enormously emotive track with it’s rich history of Italian motorsport and the excitement of the passionate Italian fans, and a track that has recorded so much of Grand Prix racing’s own history over the decades. The echoes and ghosts of the past are everywhere and it is easy to conjure up images of the great Italian Grand Prix days of slip-streaming groups and blanket finishes, prior to the arrival of chicanes and the re-profiled Curva Grande and Lesmo corners. More than ever this year, it was disappointing not to be at Monza as it marked fifty years since Sir Jackie Stewart scored his first Grand Prix victory after a hard fought duel with his peers, Jim Clark, Graham Hill, John Surtees and Dan Gurney which came down to a direct fight with team-mate Hill, after Clark and Surtees were sidelined, and Gurney delayed with mechanical problems. Stewart was at Monza this year, along with his 1965 winner’s trophy, and he had the chance to very briefly drive a 1.5 litre BRM P.261 of the same type he had used to score his first Grand Prix victory. Photos of Jackie in the distinctive BRM on the Monza finish straight brought memories flooding back of my first sight of him in a P.261 at Warwick Farm, during the 1966 Tasman Series, when I first saw him drive almost fifty years ago only months after winning at Monza. Jackie’s white helmet with black peak and tartan band exuded composure in the dark green BRM, as he played tunes with the little V8’s throttle and danced between the Armco barriers that lined the immensely challenging Causeway sequence of corners. To be quick through the Causeway, a driver required the very best of judgment, balance, skill and bravery, all of which could be very clearly seen as the drivers arms worked overtime behind the transparent Perspex windscreens. The Tasman races at Warwick Farm with the likes of Clark, Hill, Jack Brabham, Denny Hulme and Stewart cemented my passion and love for the ‘art of driving’ and for the sport; both of which later came to dominate the course of my life. The combination of colour, sound, speed, danger, legendary Grand Prix characters and a magical setting could not be matched by anything else at the time. Unfortunately, somewhere along the way to it’s current standing, Grand Prix racing has lost some if it’s shine; it still has colour and speed, but the sound, elements of danger, unique characters and circuits have all been sanitized to such an extent, that for me the overall package seems hollow and lacking. It was therefore a great disappointment to learn that Formula One lost an excellent opportunity to present to today’s Grand Prix fans a legendary World Champion and an iconic Formula One car with a wailing exhaust sound. The cars and drivers of the fifties and sixties laid the foundations of the sport’s history and as such deserve every bit of respect and recognition at every possible opportunity. The opportunity to commemorate and applaud a great World Champion last Sunday was completely squandered. It is a disservice to the Grand prix followers of today and the great drivers such as Jackie that Formula One does not sing their praises and present them in all their glory to commemorate their achievements. 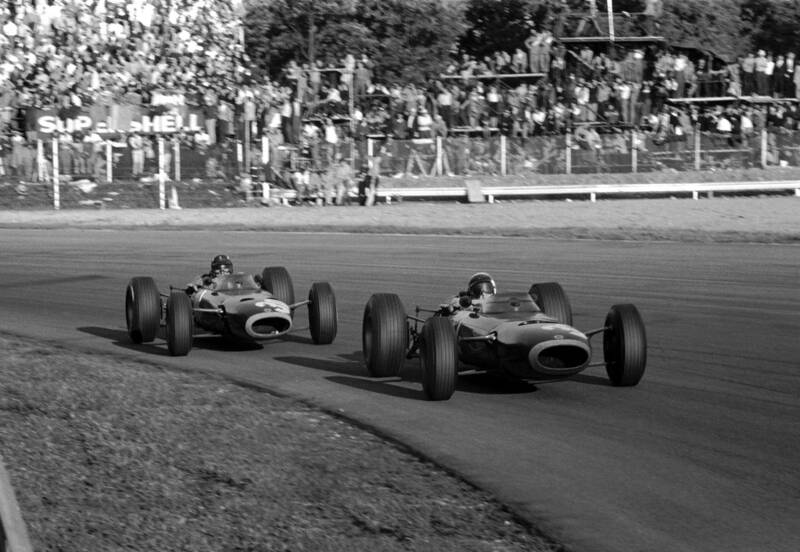 As it was, Jackie was only permitted to drive the little BRM last Saturday for just over a lap to the start finish line; he had passed Monza spectators before most people would have realized the significance, and there was no second lap to capture the moment; many felt it more an insult than a celebration. The ‘tifosi’ of the day recognized the newcomer’s brilliance in 1965 and showed their enthusiasm for his exceptional drive as they lifted Jackie high on their shoulders, complete with laurel wreath and trophy to cheer his amazing achievement in only his eighth Grand Prix. Three World Championships claimed during one of Grand Prix racing’s most dangerous periods are testimony to his skill and bravery. Following retirement, he has remained active as great ambassador, communicator and salesman for the sport. Surely Jackie deserved far more than a solitary lap from an unknown spot, then back to the start-finish line with little fanfare. I only wish I could have been there to applaud and show my respect and admiration for a unique man and a truly great driver, along with those other passionate enthusiasts and historians of the sport who really understand and appreciate his achievements and contributions during his life. It is fair to say that Jackie is not everybody’s cup of tea, for he has never been afraid to express an opinion or fight for a cause. Nevertheless, he did not deserve to be publicly belittled some years ago by former FIA President Max Mosley for expressing an opinion. In many cases his comments and the courage of his convictions made for change from which all motorsport benefitted. His safety crusade in the late sixties and early seventies and the resulting changes saved numerous lives. Jackie is a man who is famously always busy in his professional life, yet he is one of the most considerate and well-mannered people you are ever likely to meet, qualities that Mosley is very much lacking. In times of need, Jackie has also proven to be most unselfish, caring and considerate of those facing personal challenges, where he has been known to use his considerable network to assist, yet no detail is too small for him to deal with personally. Sir Jackie Stewart has achieved so much and done so much for motorsport, that making time in Sunday’s race programme at Monza would have cost Formula One so little time, but added greatly to the sports heritage for those who do love the sport but are too young to have seen him race. I will be forever thankful I had the chance to see Sir Jackie Stewart display his skills at Warwick Farm all those years ago on a circuit that demanded respect and rewarded the most skillful. It was a joy and a privilege to watch him at work.